Murrayfield Racers have signed a deal which secures their future – but have ruled out applying for the Elite League. 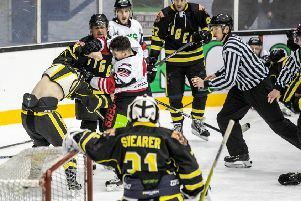 The club, who host Sheffield Steeldogs in their final National Ice Hockey League North Cup game tomorrow (face-off 6pm), have announced a deal with the board of directors at Murrayfield ice rink that will see the team compete at the Edinburgh facility for the foreseeable future, However, the level of opposition next season remains unclear. Racers won the ice-time contract at Murrayfield last summer from previous tenants Edinburgh Capitals who played in the UK-wide Elite League. The moved ended 20 years of professional ice hockey in the city. 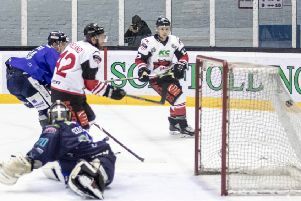 After failing to replace Capitals in the Elite League, Racers are playing in the amateur Scottish National League, remaining undefeated in all competitions to-date, as well as pitting themselves against semi-professional, NIHL teams in the North Cup, losing all 11 of their matches in the home-and-away round-robin competition. Racers director Willie Dunn said: “I’m very pleased that the hard work put in by investors, directors, fans and of course our players, has been recognised by the Murrayfield Ice Rink board. What we have is a letter of intent that they will enter into a contract with us for future seasons. We can’t sign anything right now because we don’t know what league, or how many games there is going to be, but as soon as we know that we’ll sign a contract with the rink and that gives us security going forward. Asked on his personal preference for the club, Dunn continued: “To be honest, we’ve really enjoyed our time in the SNL, we’ve had some really competitive games, especially recently. If that league can be improved or expanded then that would be great. “The NIHL, we learned form that. It’s a big step up for the squad that we have at the moment, whether we would want to take on those extra travel costs as a full-time member of that league we’d have to look at that.